26.03.2010 Updated code to be able to clear the selection It’s only the code for the file “AutocompleteForPeoplePicker.js” that has changed. Thanks to Steve for pointing out the bug. 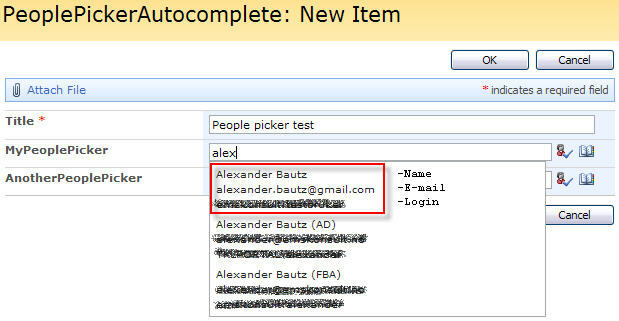 This solution adds auto complete functionality to a standard SharePoint people picker. This solution is built with the autocomplete widget from jQuery UI. The values are pulled from the user list based on a query. All users with an email address are available. The jQuery-library is found here. The pictures and the sourcecode refers to jquery-1.4.min. The autocomplete widget is not supported in previous releases. The sourcecode for the file “AutocompleteForPeoplePicker.js” is found below. // Find all users from userlist. Parameters "userListBaseUrl" and "userListGuid"
userListGuid: The list Guid of the user list. Save as “AutocompleteForPeoplePicker.js”, mind the file extension, and upload to the script library as shown above. I will update the article on Edit date, single line text, number or boolean columns directly in list view based on this script to allow setting a people picker field directly in a list view. This is a great design. I have played with it for a while but have been unsuccessful. I created a new list and am only trying to run this code. I have no errors, but no auto complete. I even copied your directory setup, but sitll not working. I have upgraded all jquery files and UI files. I have updated my listname with my user list ID. never mind, I just got it. I am not sure if this was my issue all the time, but I just updated my source link to a JS file and it works. sorry to bother you. Updated code line 47-51. Thanks for spotting the bug. Great post but I am curious to know what is the “User List” actually? Is it a list created by the users or some in-built list? The user list is the built in “People and Groups” list in SharePoint. Thanks I got it to that point. But still my autocomplete is not working…..I know it is difficult to tell from your end but what is the most common cause for not working? indexOf, 19, 7 and substring are no longer necessary then. Thank you for the tip, i have done very little with regex, but realize it is quicker and easier. I will make a post of a new init_fields() function and give you credit for the regex. hi.. Need help how can I find userListBaseUrl ??? The “People and groups” list is located at the root of your site collection. Any subsite must refer this list from the root. Go to the root of your site collection > go to the “People and groups” list > right click > view source > search for L_Menu_BaseUrl. The value for L_Menu_BaseUrl is your managed path “root”. This looks awesome and exactly what I would like to incorporate into my environment. I’m a complete noob so I’m really sorry if these are silly issues…. but I still am not getting it to work on my new form. My list where the newform.aspx is on a subsite. What would the base URL be? Is this correct: those file names correct in the CEWP code because they weren’t in the downloads. I should change the thenm to 1.8.5 instead of 1.8? If you download another version of the scripts and css you must update the CEWP link. To find the baseUrl for the user list, go to the list – view source and look for the variable L_Menu_BaseUrl. I tried out this script and it works great! How can we extend this script to make the same functionality available to textbox. For example: If a username column is created as single line of text in sharepoint list and would like to get the same funtionality to it. Also, currently the program gets users from user information list. Is it possible to get all the users (even if they are not present in user list)? Hi, Alexander: Great collection of solutions! Is there a way to point the AutoComplete lookup to the same domain lookup that the SharePoint people picker uses rather than the site’s user list? Only entries with email address should be available/visible. I have a project where we need users to fill in the ‘Manager Responsible’ required field as an email address and a workflow sends an email to that address. The issue is that the users aren’t validating the field before saving the form so in some cases user ID’s without email addresses are selected or the manager field does not resolve correctly and is saved as blank, hence no email is sent. The form still saves even though the field is required, and blank. Ideally, we need the form to not save until the field is truly validated, as any other well behaved required field would. A filtered auto completing people picker would go a long way to easing frustration as well. I’ve seen several auto complete solutions but they all seem to perform a lookup based on a list internal to the site, none perform a domain based lookup. We’d like to avoid using custom forms, unless it’s a last resort so your scripts are appealing. Well done sir! Although the html in the dropdown wasn’t rendering for me. It literally shows tags so I modified your getUsers function to just show item[‘Title’] for the label. Amazing work, I just applied it on one of my forms, and its works great. It was not working initially cause I was trying to apply this to a customized form and when I actually used a CEWP on the default forms, it worked. I had to modify your js because I was able to see the HTML tags in the auto complete container. Thanks again for such a great solution. is there a way to enable this for sharepoint 2010???? Hi, is the “autocomplete widget” the only component you are using from jQuery UI in this script? I tried to deploy this on Sharepoint2010 ( Newform.aspx) . But its not working. Will you please guide me on this. This solution is created for SP2007 and has not been tested in SP2010. I suspect it has to be modified to work in SP2010. If i view source on the user group in People and Groups, what should I look for? Is there something I can do to make this work with 1.10.2? Thanks very much.